Then we went upstairs and shaved the sides, I bought him some spiking gel, and that’s all there was to it. He has had a lot of interesting reactions to his hair, first of all from his dad, who doesn’t think it is quite as awesome as the boy does. His daddy is a bit on the conservative side, but not so far as to forbid the ‘hawk. Most people think it looks cool, but there have been more than a few raised eyebrows. It has been a good teachable moment for my son. The lesson is that you can’t judge a book by its cover but that doesn’t stop people from judging. 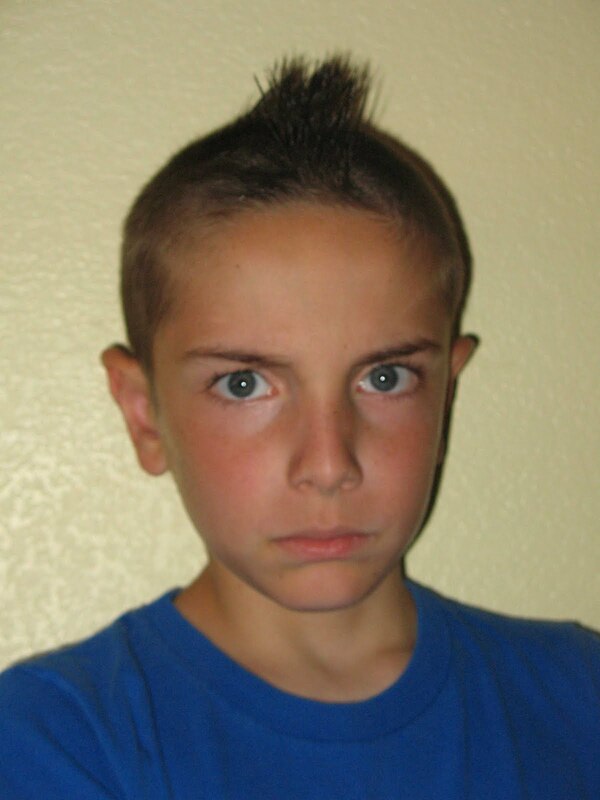 Because here’s what that my boy wants that mohawk to say about him: cool and tough and awesome. And here’s what the mohawk can say about him, from a judgmental world: antisocial, punk, anti-establishment, trouble. My son is none of these things. Well, okay, he is a bit of trouble, but just the right amount for a curious 8 year old. He and I have had good conversations about the importance of first impressions, and why we will cut the ‘hawk off before the first day of school. My son has the freedom to wear whatever he likes within the dress code for his school. But should he? People judge on appearances. Zig Ziglar said it best: “I would go to war and fight and die for your right to wear that, but I wouldn’t hire you.” I want his new 3rd grade teacher and peers to judge him on his actions and interactions, not by any preconceived notions about a hair style. He understands this. He also knows that when he is a bit older than eight and decides he wants to, he can choose to wear that ‘hawk on the first day of school and handle what that brings. He also knows that later in the school year, after his teacher knows him for all his strengths and faults, I will likely let him have a mohawk again. We have a lot of spiking gel left.